This clever kite shape will definitely swoop your friends’ off their feet! Read below to find out more about this fab make. 1. Begin by printing your free template and cutting an A4 sheet of Dovecraft White Card down to 20cm x 20cm. Score and fold as shown on your free template. 2. 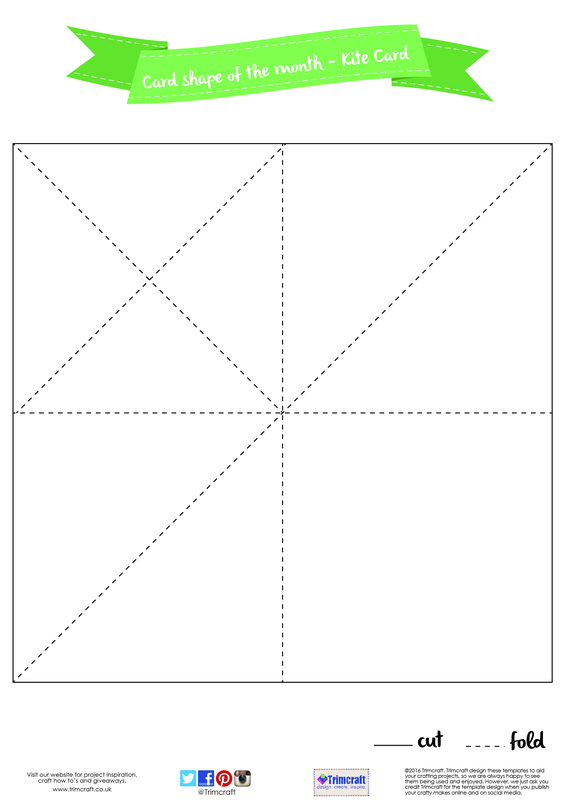 Fold your card together to create the design of the kite shown in the picture. Adhere the bottom sections down with Dovecraft Perma Fix tape. 4. Cut four coordinating triangle sections from your Simply Creative Happy Days 6x6 paper pad to fit the sections on the kite design. Adhere each section with Dovecraft Perma Fix tape. 5. Cut two larger triangles of patterned Simply Creative Happy Days paper to adhere to the stand of the card with Dovecraft Perma Fix tape. 6. Die cut the bow tie design from the First Edition Clothing dies set 6 times on different sheets of Happy Days paper. 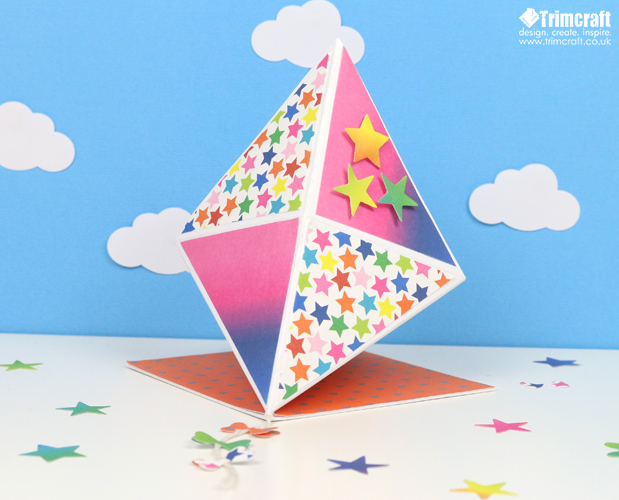 Also die cut a selection of coordinating stars using the Dovecraft Star die set. 7. Thread a needle with a length of Dovecraft Twine, ensuring to add a knot to the end. From the inside of your card, pierce a hole and pull the twine through. 8. Cut the twine to 8.5cm and adhere 3 bow tie designs down the length of twine. Place one more on the top of each to make it more secure. Stick your stars down on the right corner of the right with 3D foam pads. What a sweet card! What other designs could you make with this fab shape? We would love to see your versions in the Inspiration area so remember to upload them! When uploading to social media, don’t forget to #Trimcraft!